The Marol Academy Secondary School is located in Warrap State, South Sudan. HART has supported local efforts since 2011 to establish both the Primary and Secondary Schools as the excellent academic institution they strive to be. In 2014, the ongoing conflict in Juba presented local communities with a difficult setting. As security became a priority once again, the largely Kenyan-staffed Marol Academy found itself in a complicated position when it could no longer guarantee the safety of its foreign staff. 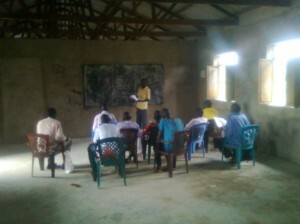 Christian teachers from Kenya have played an important role in maintaining Marol Academy and supporting the Christian community in the village of Marol. Notwithstanding the security concerns, three teachers volunteered to return to Marol to continue their vital role in providing education to the community. Since 2014 the secondary school has grown tremendously. This development, largely due to the commitment of the Marol Academy staff, demonstrates how even a small amount of funding can be multiplied to create profound positive changes. There were 50 students attending the secondary school in Marol in 2014. 45 of them were male students and only 5 female. In a recent update from Marol, HART learned that the number of students registered for the 2015 academic year is 180. 160 of them are male and 20 female. This indicates that the relative male to female ratio has remained the same, but the absolute number of students more than tripled since last year. The motivation of the community to address the infrastructural and educational needs has resulted in some major improvements, but there is still a lot left to do. One of the issues that Marol Academy hasn’t been able to find a solution to is how to keep girls in and beyond secondary school education. The problem doesn’t lie solely with the academy, as there are many external factors that also play into this issue. The very existence of both the primary and secondary schools are indicative of a strongly devoted community willing to embrace education. “When women thrive, all of society benefits.” – Kofi Annan.